Fully functional command line SMTP mailer. Add multiple attachments, cc, and bcc recipients. Only $49. This product makes it extremely simple to send an email from a command line. You can specify the sender and multiple recipients including CC and BCC. It also supports multiple attachemnts and server authentication. Here is a short example of how to use the SMTP Mailer. You can choose to send the email directly or you can show it to the user before sending it. This allows the user to edit the content. 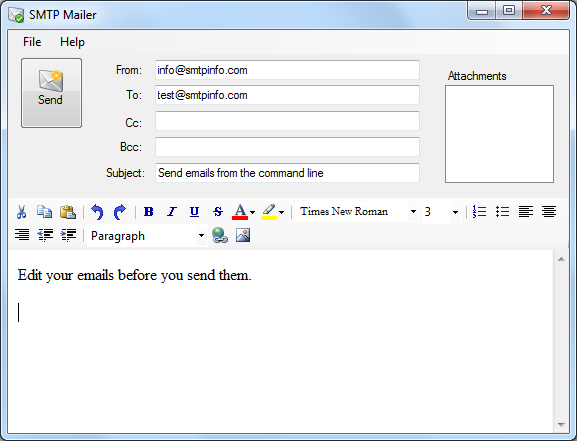 If you add the GUI command line switch then the email will open in an editor before it is sent. The table below lists the features available in the free SMTP Mailer and the professional SMTP Mailer. from Email address of sender. to, cc, bcc Email address of recipient. Multiple recipients of each type can be added by repeating the parameter tag. subject Subject of the email. body Body text of email. bodyfile File name of a file containing the body text. This parameter can be specified multiple times. attachment File name of attachment. This parameter can be specified multiple times. Wildcards are supported since version 5.
server Name or IP address of the SMTP server. port Port number of the SMTP server. The default value is 25.
user User name used for authentication. password Password used for authentication. ssl Instructs the program to send the email using SSL. Using the ssl switch can often solve problems where the server expects a STARTTLS command. license License key that unlocks the professional features. Values of subject, body, user and password must be URL encoded when using special characters. We invite you to try the features of the Pro version for 30 days. The following license code is valid for the next 30 days. This example shows how to specify the license string on the command line. A valid license will unlock the extra features of the professional version. In the example below we use the license string 2019052261191fa50a95dc746591f96a21d921ce. 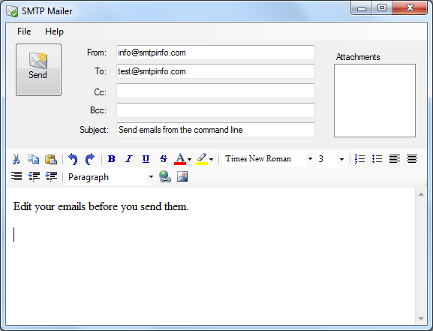 Send an email with two attachments from the command line. In this example the server requires a login and password. If you have a Google GMail account then you also have access to Google's SMTP server. Using this server requires you to use the ssl parameter. SMTPMAIL.EXE server=smtp.gmail.com from=smtpinfo.com@gmail.com to=info@smtpinfo.com user=smtpinfo.com@gmail.com password=mysecret ssl license=2019052261191fa50a95dc746591f96a21d921ce subject="Hello via GMail!" body="This email was sent using the GMail SMTP server :-)"